The first time I had this was back in the Philippines in SM Megamall, I still remember how it caught my attention because the image of flame grilled vibrant yellow coloured chicken in front of their restaurant is still vivid in my memories. Grilling chicken shown on display in their establishment is such a good marketing strategy, it just makes you want to have one. I haven’t tried this for a very long time and now I am craving for it, I never knew its ingredients until now when I was researching on how to make one, in fact I thought it was basted in butter before because of the yellow colour and the way this tasted in Philippines is citrusy buttery unlike the ones in US. If you are like me before who did not have any idea what is the marinade behind this Crazy Chicken then it is a combination of lime/lemon, fruit juices, garlic and different spices, it is also flame grilled to give it a different taste. 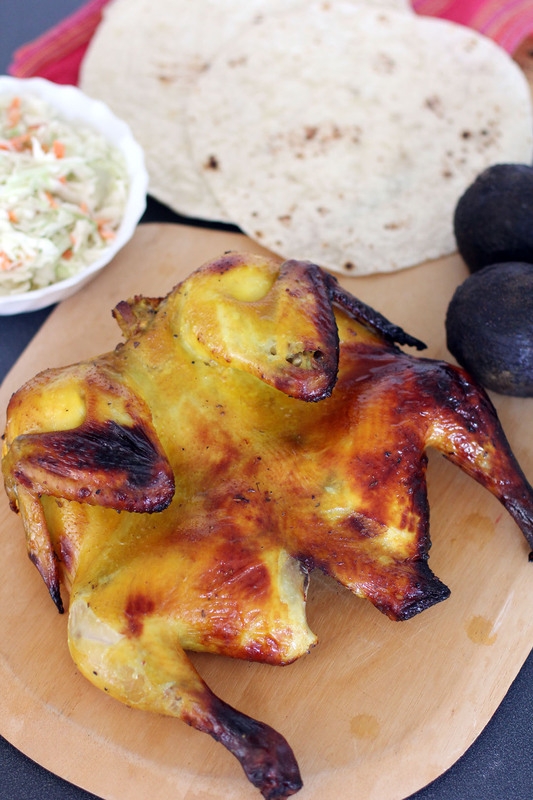 Continuous basting of the chicken gives it the colour as well as the required flavour, a good chicken dish and it goes well with some salsa, guacamole, coleslaw and soft tortillas. Combine all mix all marinade ingredients then place in a Ziploc bag. Place chicken in the bag then seal and leave it on the refrigerator for at least 24 hours. Drain chicken and reserve the marinade. Make your basting sauce by heating the marinade in a microwave and combining it with the butter. Set your oven to grill mode and place a rack on the lowest part of your oven, place chicken and grill at 180C for 50-60 minutes or until chicken is cooked. While grilling baste your chicken every 15 minutes with the basting sauce and turn it over. Once cooked serve it with tortillas, rice, coleslaw, salsa and guacamole. That looks like a good chicken! Yum! Raymund, thank you so much! I’d love to try this recipe (as in today!). In Sacramento, we have the Pollo Loco fast food chain. My mom used to have one near her home, and the chicken would be a staple. My husband burned out on it, but I was always fascinated with the process. All those chickens on a grill. Always wanted to know how it was prepared. Now thi I could definitely taste! 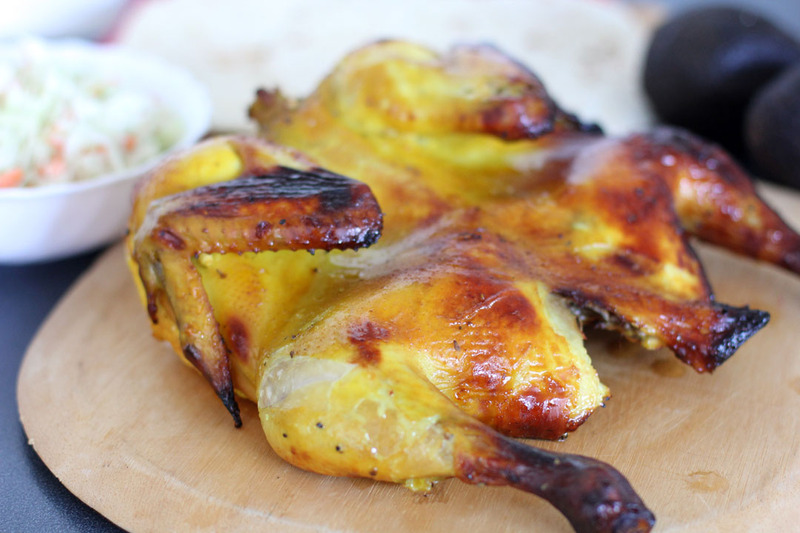 What great looking chicken and I love the marinade! The marinade sounds so delicious; I love meat and fruits combined! I will definitely try it as soon as possible. First of all, the name of the dish sounds fancy for me…. i can imagine how tender is this chicken due to the pinneaple juice, superb!!! Love that sweet n sour combination of flavours. I love fruit and protein type marinades. Filipino food and bbq are so made for each other. I love the golden color of that chicken. I also like the combination of flavors you have going on in that marinade. Making a shopping list right now, doing this one for dinner tommorrow night :). Katherine just announced we’re making this tomorrow. So I’m off to defrost a chicken. We’ll report back. Thank you for this recipe!! It was very good! I added 1 tsp of salt to the marinade, but that was the only change. The bird got roasted in the pan with half of the marinade juices, breast-side-down for the first half and then flipped. I basted from time to time as well(It takes roughly 1 hour to 1 hour and a half at 375F). When it was done, I let it rest for just a few minutes – but while still warm, I then removed all of the meat from the bones and left it in the juices for even more flavour for the tacos. Extremely tender, buttery and flavourful. I was very happy to put this on warm corn tortillas! – I also made a pico de gallo to go with this; made it really feel like summer, here, even with all of our spring rain. Thanks again! You have some really great things on this blog of yours. Bravo!